This article contains an income percentile calculator which will calculate 2016 income percentiles for the United States, based on all individual earners. It originates from the March Current Population Survey, so data for comparison is all income you (or your friend) earned between January and December 2015.
Who Are the 1% in America in 2016? And how about the .1%? But again, this is a rough cut. Earners at this level are even less likely to complete a survey, so there is a dearth of data at the highest end. Note too that some definitions of the top 1% and .1% only count household income. We’ll revisit with our household income article. The University of Minnesota’s IPUMS-CPS project compiles all the data we use in this tool. The CPS is a joint survey from the Bureau of Labor Statistics and the Census Bureau. The data in the tool comes from the March Annual Social and Economic Supplement (ASEC). March is when many people are in the process of doing their taxes (or have recently finished), so the income estimates should be very good. We use an expansive definition of what it means for people to have or want to have a job. In response to comments and complaints about selection bias in previous calculators, we are now using people who report working at least one hour a week in the previous year, report they worked in the last year, or report that they currently want a job. All of these groups make up the calculations in this tool, and the lowest percentiles are occupied by people who did no work in all of 2015. A future 2016 calculator will screen this demographic out for full time workers, but this tool includes the widest possible definition of workforce on DQYDJ. A note on accuracy: CPS data is self-reported and introduces some inaccuracy compared to IRS reported income numbers. Additionally, before microdata is released to you and me it is topcoded. Very high income earners are easier to personally identify, so their responses might be stripped from the survey. This leaves a very slight downward bias to the data. For our purposes, we can trust the results from the calculator. 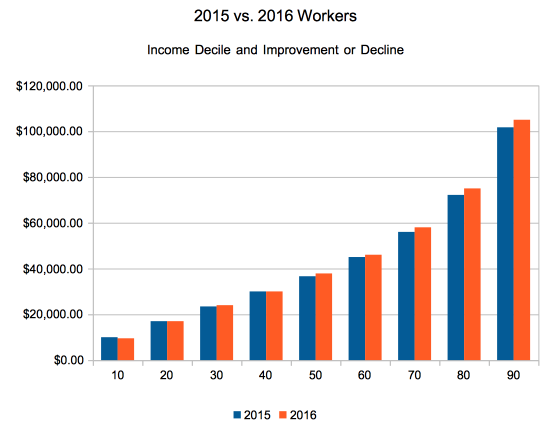 What Do We See in This Year’s Individual Income Data? Our data is mostly comparable to last year, despite the minor methodology change explained above. The median worker is seeing a nice gain this year – a full 3 and a third percent over the 2015 data, or another $1,220 a year. That’s significant when spread over the economy, and it’s good to see some durable gains showing up in the economy. Note the decline in income in the 1st decile might be the methodology change introducing additional people, or it might be more people entering the workforce. It’s impossible to say without further digging. Either way, that’s a pretty wide-ranging improvement, and not just for the top 10%. See anything else in the income percentile calculator… either in isolation or compared to past calculators? Want to see us slice the numbers in a different way? What to see household income instead? Let us know what you think in the comments! Please include information on how many individuals are in the population being discussed. It’s 92,381 data points. The weights add up to ~164,798,100 people out of a base of 185,487 data points representing a US population of 318,868,500 (some are removed due to topcoding, etc.). I’ll do a tutorial on exactly how I slice it because I want to help people play with this data as well. I have something built for 2015 I can adapt, but it’s a bit busy over here personally – look for something after I get all of the calculators out. Per your 1%er note, there would be 1.65 million individuals in that tranche, not 16.5 million; additionally, in the 0.1%er cut, there would be 165,000 individuals, not 1.65 million. Please absolutely feel free to delete this comment after reading. Ha, good looking out! Thanks, fixed. are you still excluding some individuals in your distributional analysis? such as people who don’t work and don’t report they would like to? I ask because some other sites take this same data yet use the entire population in the CPS and come up with different numbers than you. Are you excluding certain individuals in the data? TY. There’s some nuance here, so yes and no – but I’ll state it carefully. Yes, we are excluding certain people from the data. No, we are not excluding people who don’t work but want to work. Essentially, the sample is: people who reported working at least one hour per week OR reported working in the last year OR (did not work AND wanted to work). Is that pre-tax or post-tax total annual income? It makes a big difference! E.g., to take an even number, if your total annual income before taxes is $100,000/year, you fall in the 88.4% percentile. Let’s say taxes take out $33,000, leaving you with $67,000/year. That brings you down to the 76.2% percentile. Pre-tax – tax is somewhat difficult to estimate with ACS/CPS microdata. There are some estimates on taxes (especially as relates to the poverty figures), but you mostly need to model them. Is this based on individual income or both members in a dual income household. If in a dual income household, should one sum incomes and divide by two when using the calculator? I see this is individual income. Do you have median HH income? I have read in Pam Danziger’s report that 20% of homeowners exceed $100,000 v. your approx 10%. Can you help me square this data? Why is it that other reputable sources quote the US median personal income as being slightly below $30,000, whereas the figure is almost $38,000 for you? The top 400 US tax returns annually are actually (eventually) rolled up into public data. In 2014, the top 400 income earners pulled down $127,127,267,000 in aggregate.